This Dwarf slayer is called - wait for it - Bragi Axebiter. "No, Mr Axebiter, I don't find that funny at all. Your table is this way…"
This ain’t your older sibling’s Warhammer, with Space Marines battling through the grim darkness of the future in the 40K universe. This is an action RPG from the Old World - influenced by the Renaissance and Medieval period - where you drive back hordes of Plague God Nurgle's supporters. Designed for co-op play with four distinct character classes, you'll wield over 170 skills to vanquish 70 enemy types; including the Mutalith Vortex Beast, who makes Venom look like a Sesame Street character. In our demo with game director Jean-Georges Levieux, we get hands-on with Empire captain and close-quarters combat specialist Konrad Vollen. Heavily armoured, with a shield in hand, he’s your (and right now, our) frontline man. This preview first appeared in Official PlayStation Magazine. Get the latest PlayStation news on your doorstep early and for a great price! Subscribe to OPM here. Vollen is suited to crowd control, with his shield drop being particularly useful as it can stun enemies while forcing them backwards. By planting a banner, the captain can also create an area of effect that boosts the chance of landing a critical hit for any allied forces that step within it. This is useful when one of your comrades chooses to play as Elontir the High Elf mage, as his basic attack unleashes a volley of magic projectiles from the sky when they hold down X. To aim, Elontir needs only look in the direction of your foe. We take control of the pointy-eared magic wielder, and discover standing within the circle laid down by Konrad and hurling magic projectiles at a far-flung foe is genuinely satisfying. This isn’t the only instance of characters’ abilities stacking together in pleasing ways. For example, if Vollen puts his banner down and then Elontir casts his own slowing area-of-effect spell in the same place, you can make short work of any enemies within the area, who will be completely unable to strike back quickly enough. Elontir has a number of ranged attacks to back up Konrad Vollen, including two projectile attacks (a fireball and an exploding symbol) that you can guide using the analogue sticks. However, the High Elf isn’t one to dirty his own hands, and if he stays too close to the front line, his health gets knocked down rapidly. We find ourselves making tactical (read: liberal) use of the triangle button, tapping frantically to warp him out of harm’s way. 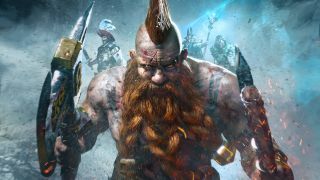 One fighter who certainly doesn’t shy away from combat is the Dwarf slayer Bragi Axebiter. This stocky chap is a force to be reckoned with, even forgoing more traditional armour. When big beasties keel over the slayer is entitled to loot just like everyone else, but instead of shields or breastplates you can kit him out with different beards and tattoos. As you might expect given his aversion to armour, we find we have to watch the slayer’s health the most closely of the three classes we get to test, though our slayer does survive – after our hands-on, we learn that’s something of a rarity. We find building up energy for special moves by performing basic attacks on X, and healing at opportune moments between waves of combat by tapping L1, is the tactic that works for us. One feature unique to Chaosbane is the bloodlust system. Powerful foes drop bloody orbs, and if you can gather enough of them you can power up a meter that allows your special attacks to take on even more lethal forms. Playing as Elontir, we let out a gleeful gasp when we start to draw on his Bloodlust meter and spinning blades emerge from one of his already impressive projectile attacks. With drop-in-and-out co-op, difficulty that scales depending on the number of players, and attacks that can combine with pleasingly crimson results, this action RPG will be with us sooner than you can say 'the forces of Tzeentch cometh' this June 2019.